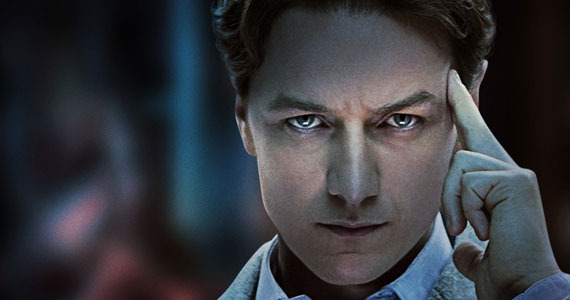 James McAvoy has been on the fringes of sci-fi thanks to his multiple performances as Charles Xavier in the X-Men movies, but he may jump into the genre with both feet. Deadline reports McAvoy is eyeing a role in Extinction, a sci-fi thriller that seems to have caused the trade a little bit of confusion, so let's sort it out. So what we know is that McAvoy is in talks for Extinction, which has a pretty sweet trio of writers in Eric Heisserer (Arrival), Brad Caleb Kane (Marco Polo), and Spenser Cohen, although no director has been found yet. Here's where things get weird. Early on the plot was described as centering on a father who realizes that he is the first robot to feel human emotion and leads a rebellion. Alternately they said it was about a man who is terrorized by nightmares of his wife being assaulted, only to become an earth-saving hero when the planet is invaded. Ultimately they seem to have settled on the whole "nightmare" scenario, while adding that McAvoy plays a father and factory mechanic who realizes the invaders may not be what they seem. It's possible these are just aspects of the same story but they sound like two separate movies. It just goes to show how messy this stuff can be in the early going, and clearly this is still very early in the process. Probably when a director is found more concrete details will emerge.